Trying out Blogger for my updates. Should be simpler and quicker than what I was doing before. Once I get more familiar with how this all works and can get it redirected from my site I'll do that. 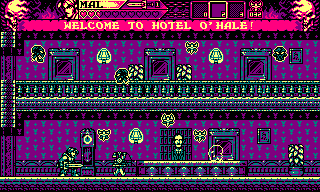 Anyways to get this started here's a new WIP screenshot from 'Hotel of Hell' my which is a PC game I'm making in the style of the Mode 1 resolution of the Amstrad CPC computers of the 1980s. Main changes since the old version I started are the brand new status panel which suits the horror theme more and coding-wise it now uses a modified version of the engine I also use for Hero - Celestial Force and Cosmic Prison Commando. The main difference in the engine is that it uses sprite layers. A layer for each color of every object so I can control the colors independently. Each room has it's own selection of the 4 colors in the main gameplay area. The status panel has it's own seperate selection of 4-color schemes.